Well lots of knitting FOs to show you from the last few weeks! I feel like I have really moved my knitting on in the last few months – perhaps my letter has been answered?! I have knit up quite a few gifts over the past few weeks and wanted to share them with you. 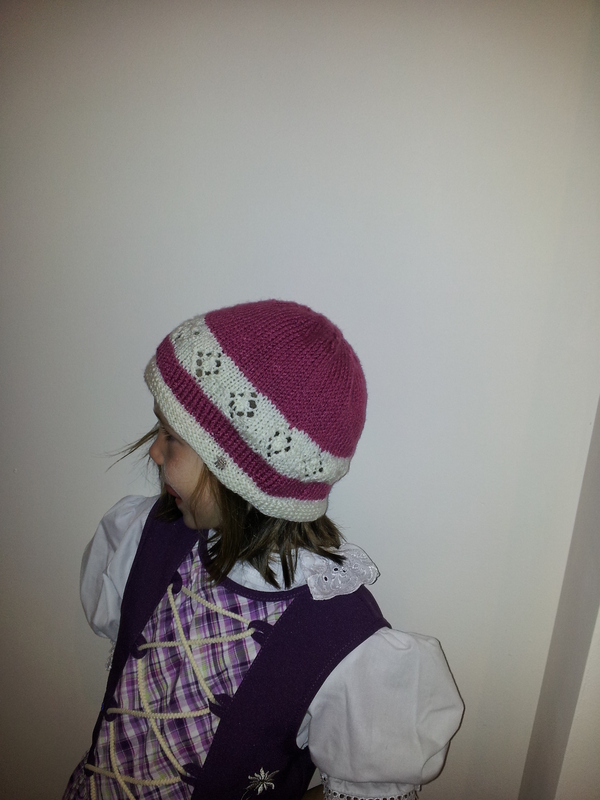 Firstly, a hat for little Heidi who is the grand old age of 6! Heidi is half German so you can see she is wearing a beautiful traditional German dress for her birthday in the photo! The pattern is one I found on Ravelry called in between seasons hat and I really like the pattern. However I am not familar with the circumferences of children’s heads and knitted small and it was *tiny* so I had to quickly knit another one up the day before her birthday. I knitted the large size and although it is baggy I think it is better so she can grow in to it. I was so delighted when she opened it that she loved it and put it straight on her head and wore it the whole time we were there! Kids don’t fake that stuff and I was so touched that she liked the gift so much. Another birthday this week was Emma’s eldest son Thomas, who was the grand old age of 9! He loves the game Minecraft so I knew what he would want! Upon opening Thomas whipped the hat straight on to his head to admire himself in the mirror but it couldn’t compete with the Xbox and he headed off to get back to the real Minecraft! Bless him! He doesn’t like having his photo taken so no modelling from him I’m afraid! You can see my full project details here on Ravelry. 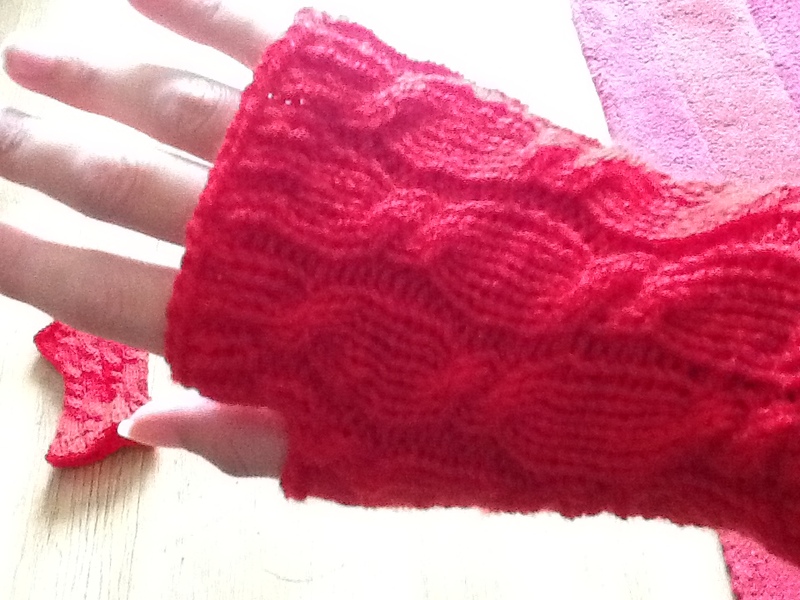 Finally, some mitts for my Mum. She keeps chickens and I wanted to make her something which she could wear but still open the hutch etc. As you can see – I’ve learned to CABLE too! Does this make me an intermediate knitter?! They look small when not being worn but are nice once on. The thumb gusset is really nice and is not required to pick up any stitches, which inevitably leads to holes for me! I sent them off and haven’t heard back so I hope she liked them. 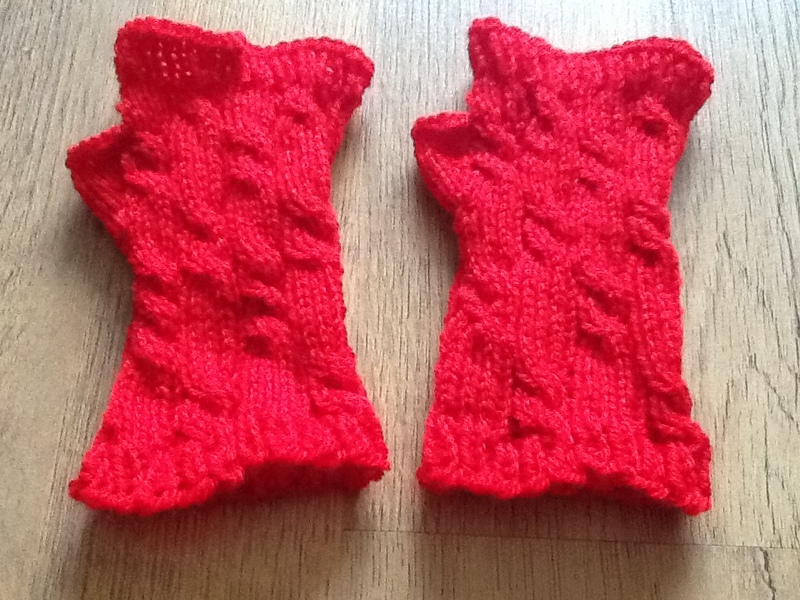 I have knitted another pair in a sandy colour for my Auntie as it is her birthday later in the month. Ravelry project details here. Well, that’s knitted gifts. 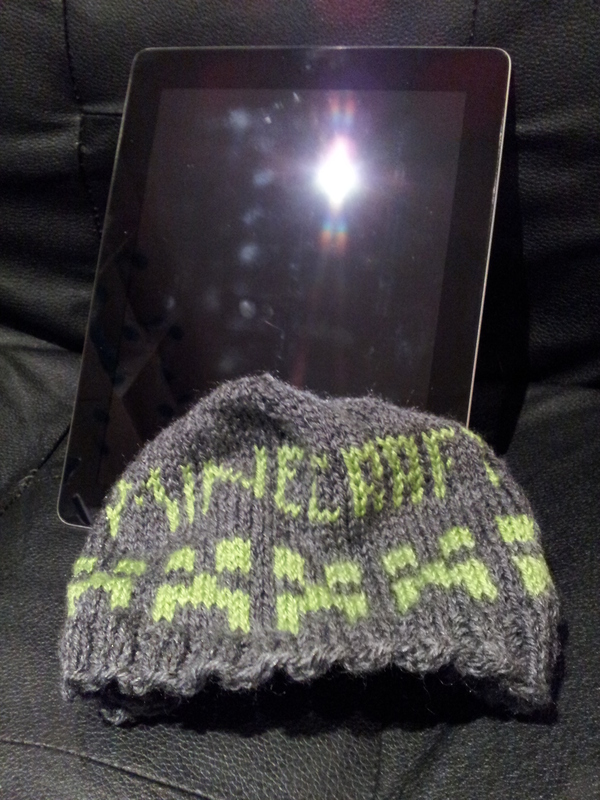 If you knit it would be great to have you as a ‘friend’ – here is my profile page on Ravelry. Do like to knit gifts, or fashion stuff? Have you tried any new techniques recently in any craft? With Stitchy broken luckily I had a non-sewing project up my sleeve. 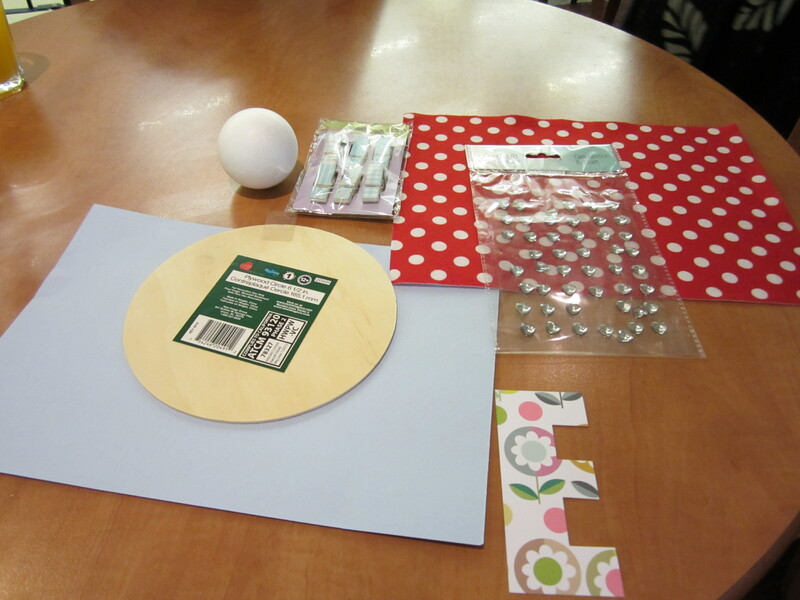 I have spent a lot of time pondering my Ready Steady Craft project for Emma. MANY hours have been spent on Pinterest in pursuit of this project! 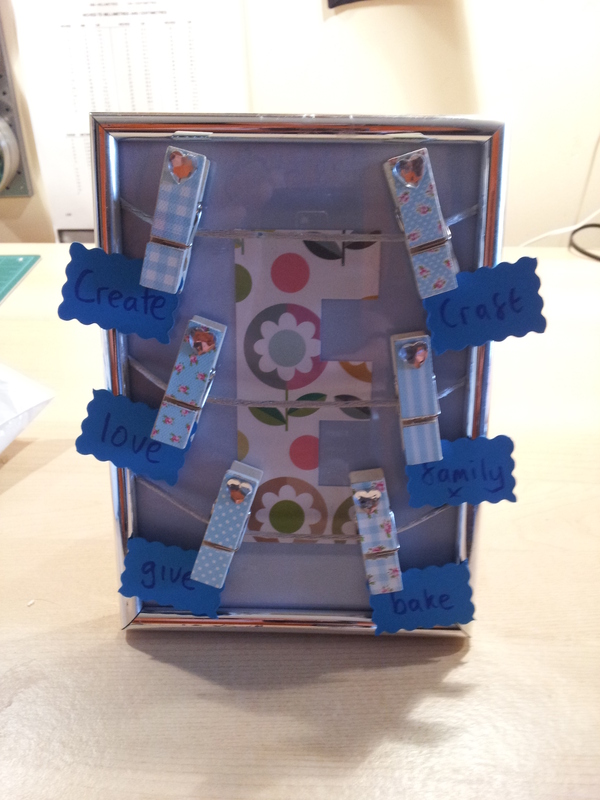 Photo frame peg board with initial. I have populated with Emma’s passions but thought she could add little photos if she wanted. Crating salver. Just a little platform for her to display her crafted wares upon. I had a couple of mini-disasters with the salver which means I am now properly unhappy with the finished item, but hey had fun doing it so that’s the main thing! Can you believe how much stuff she managed to make from it!! I just love all of these things and think she is so talented. We both agreed this was great fun and would do it again. Now we have done it once we both would select slightly different things but it was great fun. I think this may become a great fun holiday ‘thing’ we do! 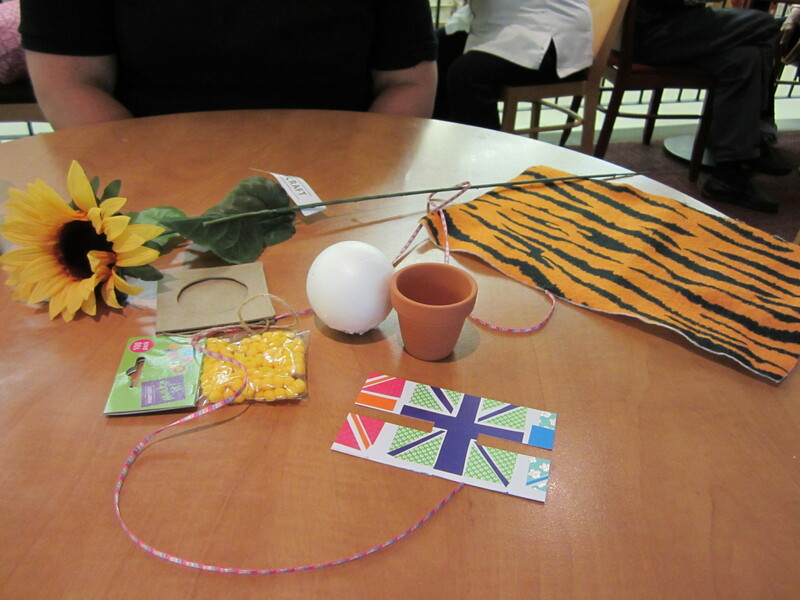 Have you ever participated in a Crafting swap? How have you fulfilled your creative needs when you’ve been without your sewing machine? What would you have crafted? Well I feel I have turned a corner with my sewing. I have finally completed a dress which I am remotely proud of! It is an unusual design as it is a wrap dress so – my goodness- it takes a lot of fabric. However it is very secure and you aren’t worried about it coming undone, the ‘wraps’ are very well secured. If you look carefully you can see the overlap. One criticism of this dress would be the complication of the tie around the waist, working out whether to have the left piece or the right piece on top is quite confusing, and having worn this a few times now I still am not too sure. This project had a tumultuous arrival as my sewing machine broke whilst I was making it, so some information about the dress can be found in that post too – happily Stitchy has now made a full recovery! 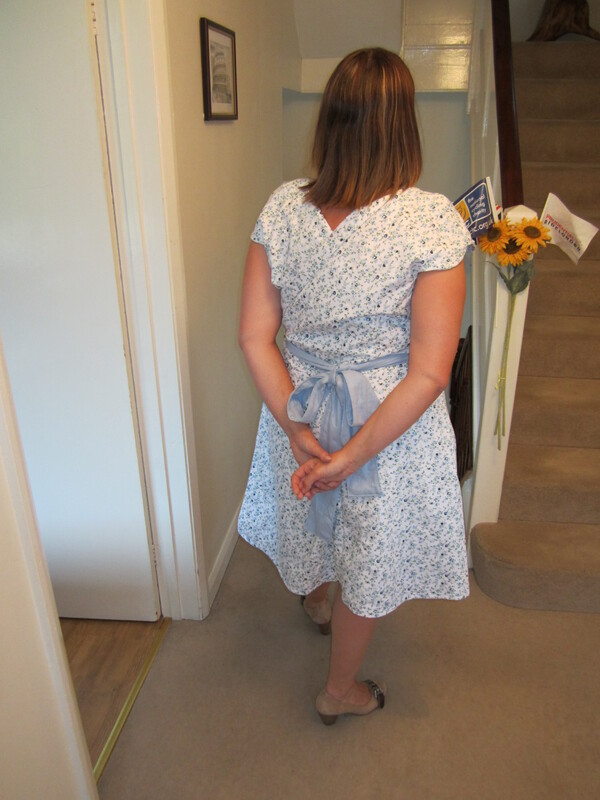 I am so pleased I did the extra steps to make this dress special, I underlined it by hand and sewed down all the facings by hand and am pleased with the outcome. Due to the design of the dress it does look rather ‘homemade’ – when was the last time you saw a wrap dress like this in a shop? – but I like it so don’t mind on this occasion. Have you made the Collette Crepe? What do you think of the ‘homemade’ vs ‘handmade’ debate?! Do you hand sew to make a project extra special? Another lovely quilting idea! 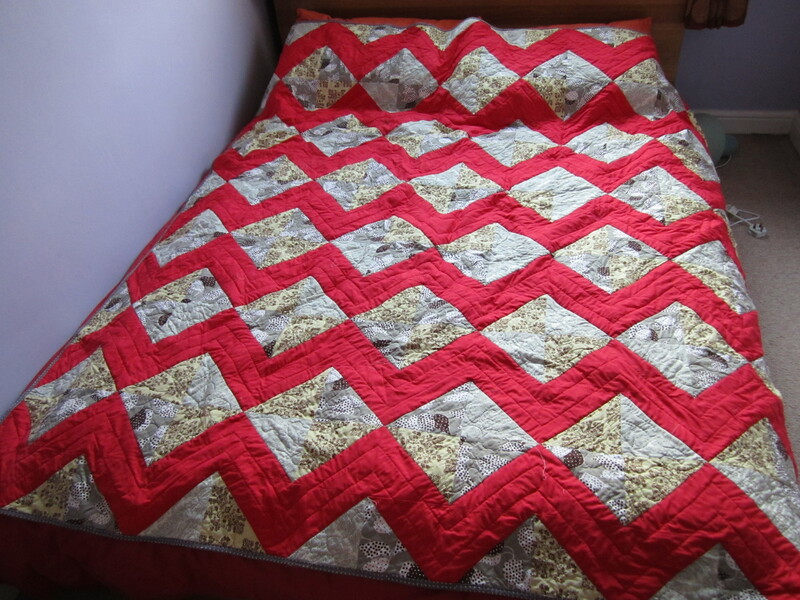 I thought this would be a very simple way to make a bed sized quilt. I looked through my yardage and found that I had enough to whip one of these up for the spare room. Cut lots of 10″ squares – sorry can’t remember how many I did now. Quilt top all done! I messed up in the arranging and didn’t get the Chevron pattern quite right, I realised this as I was basting: But hey, only you lot know what I was aiming for so it still is an eye-catching design – I am not going to let that bother me! 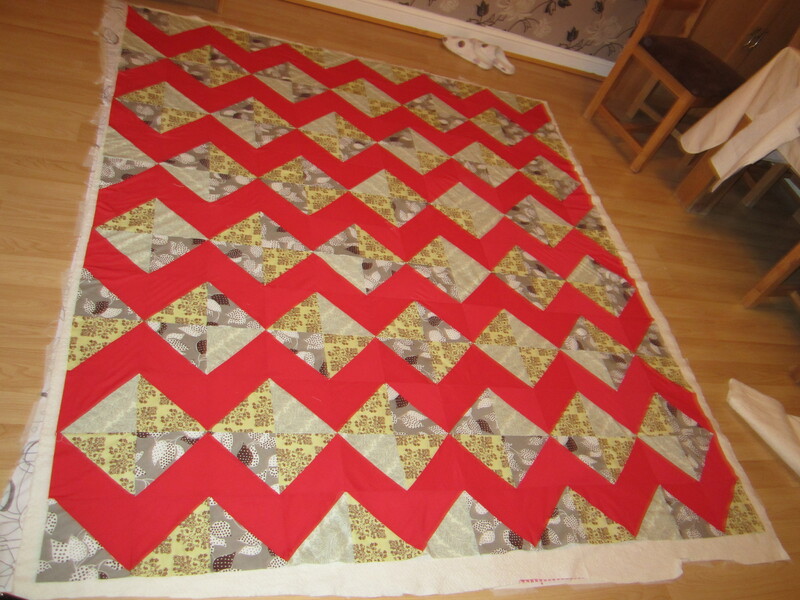 For quilting I did fat lines through the red zigzag and just a wide stippling in the squares. It is a light quilting but effective. I used a purple and cream polka dot for the binding. Here is the final project on the bed it was made for: I am really pleased with the final make. I am not the only one… n.b. strictly no cats allowed in the spare room. As you can see, he is seriously contrite about having been caught in here. Have you tried making this type of quilt? Would you have started over having realised the design error? 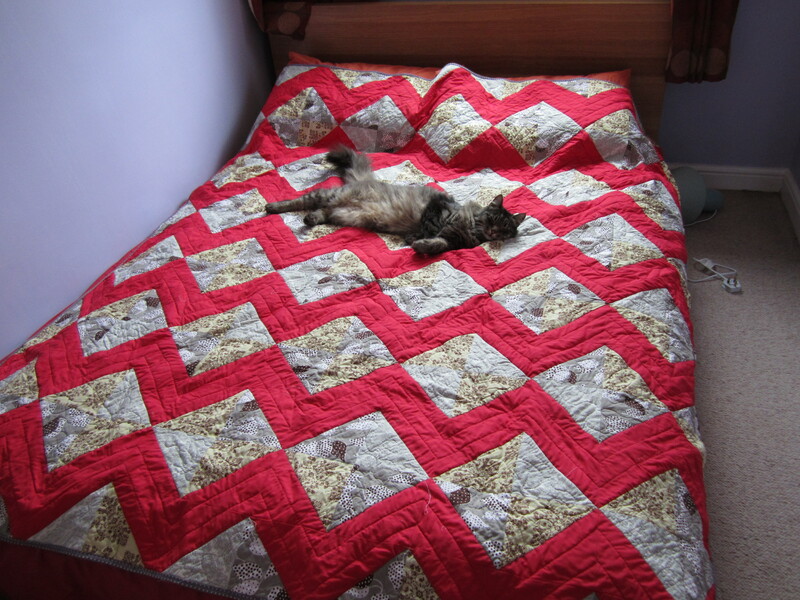 Does anyone else have cats who ADORE homemade quilts?! 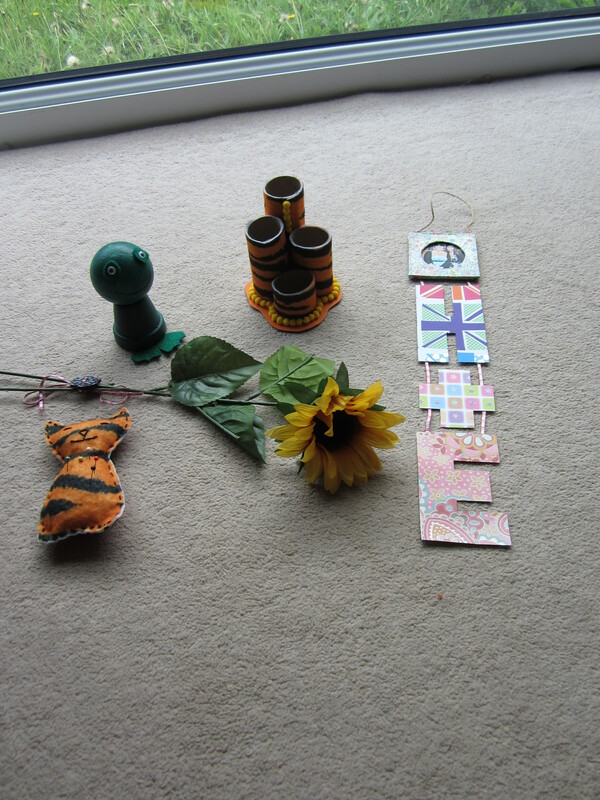 Just some quick finished objects today which I created for my sister for her birthday. 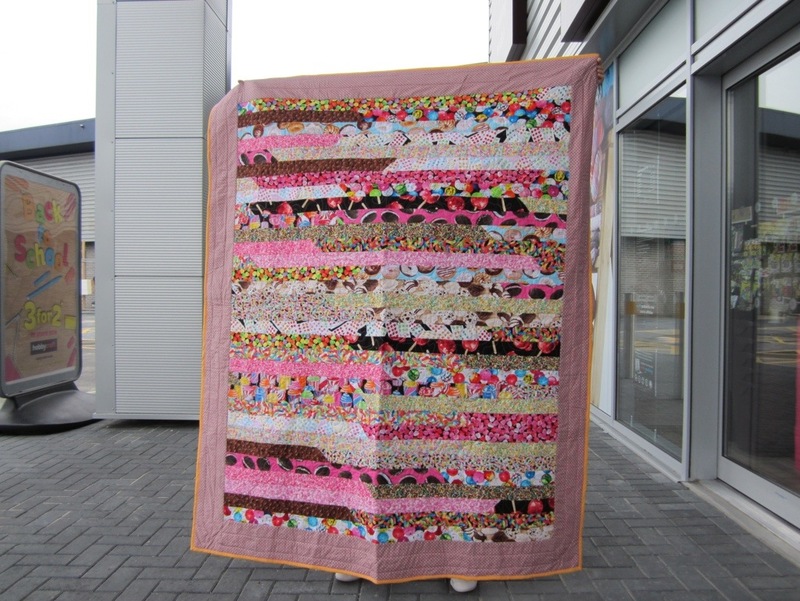 I made this with an Amy Butler quilting weight cotton I bought in John Lewis as a remnant on a previous London visit. This fabric was seriously lovely to work with! I printed the template on to tracing paper and have used it many times. By the way, I found this tutorial using tipnut – a fantastic place for online tutorials. I know Helen wanted some napkins as I mentioned I’d made some for my Step-Mother and she said she’d like some too. She’s also admired the fabric when I bought it so I hope she likes it. I also gave my first substantial knitting success away! 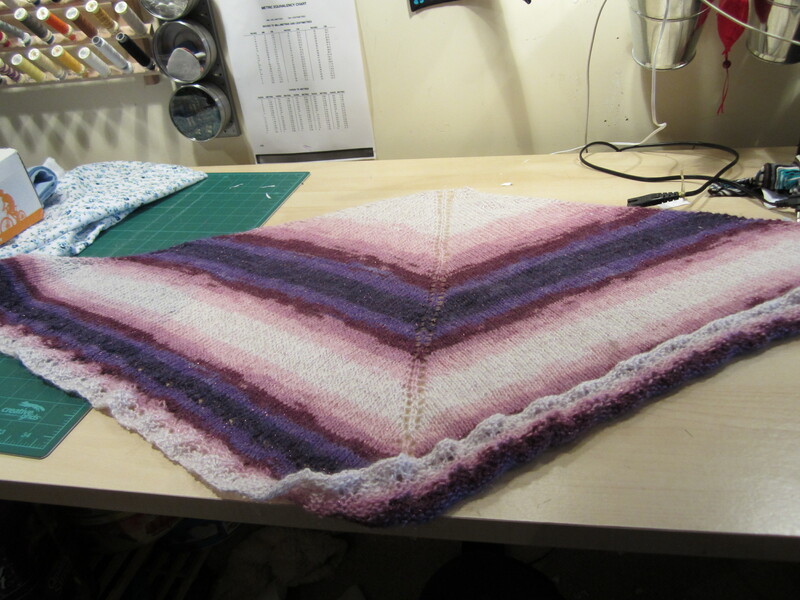 I finished knitting the Oaklet Shawl over Easter. I had purchased the wool at the Craft for Crafters event back in January and found the pattern on Ravelry by doing a search of what others knitters had completed with this yarn. Here is my finished project on Ravelry for this make. Have you got a favourite napkin pattern for gifts? Do you use Ravelry to find projects for yarn you’ve fallen in love with? Does it make a project more special when you know it is for someone you love? I really want to get better at sewing knits. My ready to wear wardrobe is full of knit fabrics so I think learning how to sew these properly would be a chance to incorporate more me-made garments in to my daily life. Another Tiramisu – other one was a bit ropey, not sure how I managed to mess up a dress everyone else found so easy! Some projects from Sew U Home Stretch – this book was a huge hit in blogging world about six months ago but now it seems to be impossible to find. Maybe that is how I picked it up for £3! Have you tackled the knitted monster?! Do you have experience with any of these patterns? 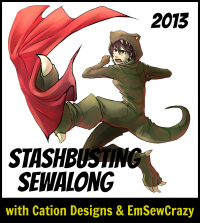 Do you have any good online sources for fabric? 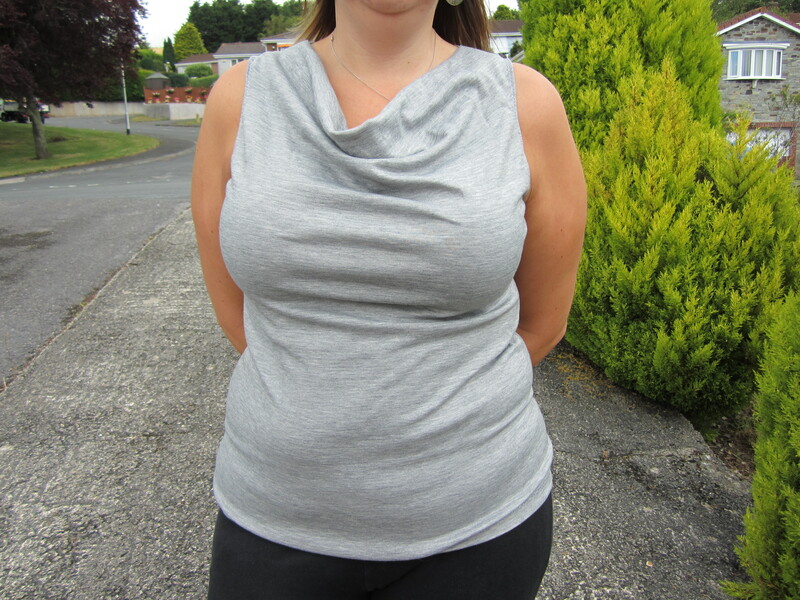 I made this top ages ago, but as I talked about it on my blog I thought I would post about it. The cowl is very flattering and sits well on the bust. 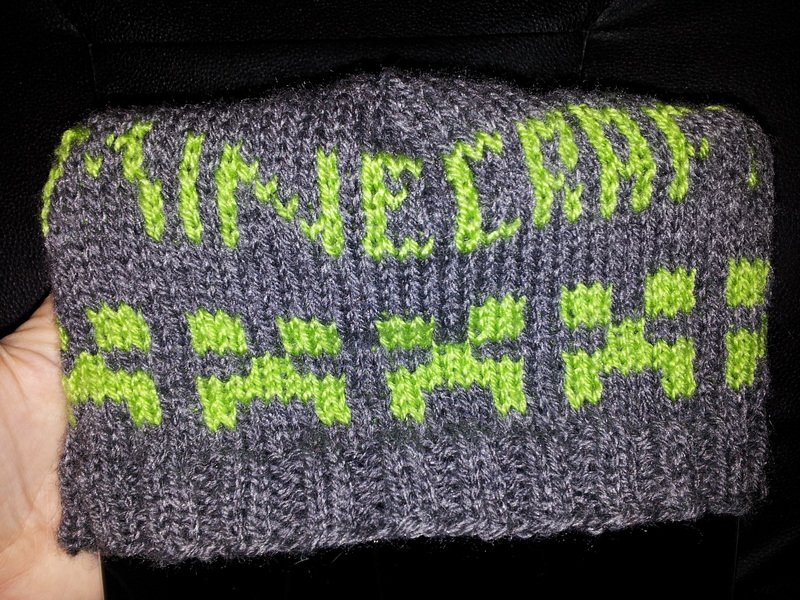 The inside edge of the cowl is unfinished, Which I was a little worried about but it is absolutely fine. Here is a little confession: this isn’t actually the one I sewed on my birthday – I mistook the ‘grain’ of the fabric and sewed it with the stretch going top to bottom instead of left to right. I could squeeze in to the top, but only just. Yes, I am that stupid – it had RIBBING on it for goodness sake! Oh well, live and learn. 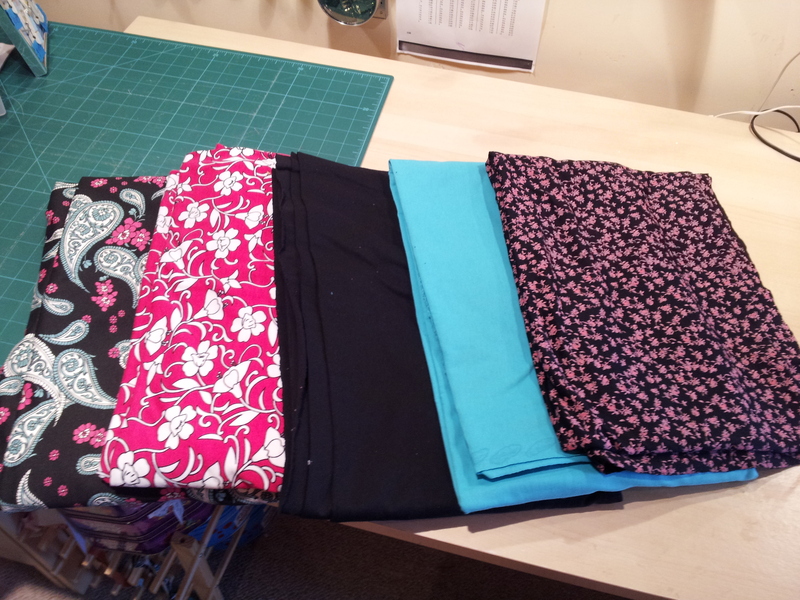 I got both tops out of one metre of the fabric though – that is seriously good value! I would really recommend this pattern. Great price. Quick to put together and a stylish finish. Another great Maria Denmark pattern! Have you sewed the Day to Night top? Have you ever got the grain the wrong way round?! What do you look for in a pattern? I just love our capital city. Having studied there but moved back to the sleepy Westcountry it will always hold a special place in my heart. 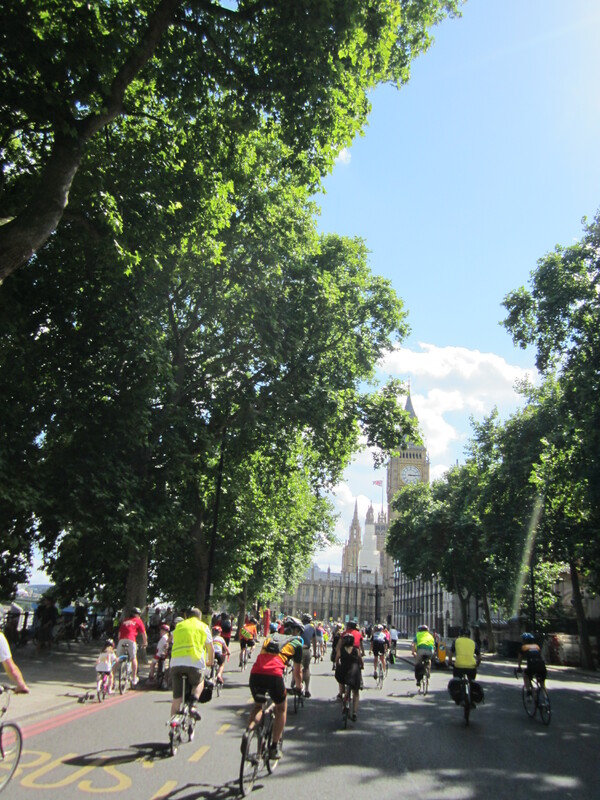 I came up last weekend to participate in the RideLondon cycling weekend – what an absolutely wonderful event! 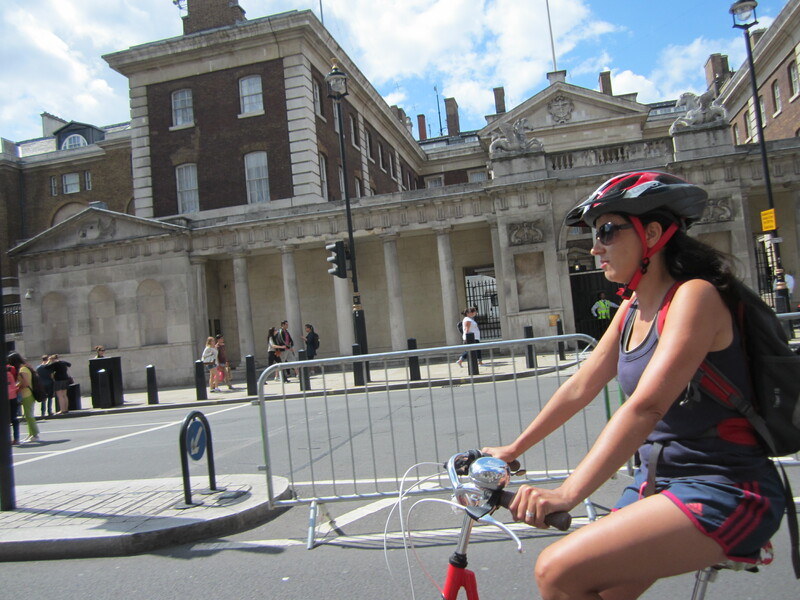 For those of you not familiar with this inaugural event – on Saturday 3rd of August they closed the roads to motorists in an eight mile loop around London’s most famous streets and made them exclusively for cyclists! Houses of Parliament, Buckingham Palace, Tower of London, Millennium Bridge, London Eye and more were all on the loop. There were also festival zones with loads of other bike amenities, concerts etc. It was simply amazing! I got a great goodie bag -oh the difference between that goodie bag and the one I received from Hobbycraft the previous weekend! This was SO much better! Mr Frog and I joined my sister Helen and Brother-in-law Bruce on the ride. 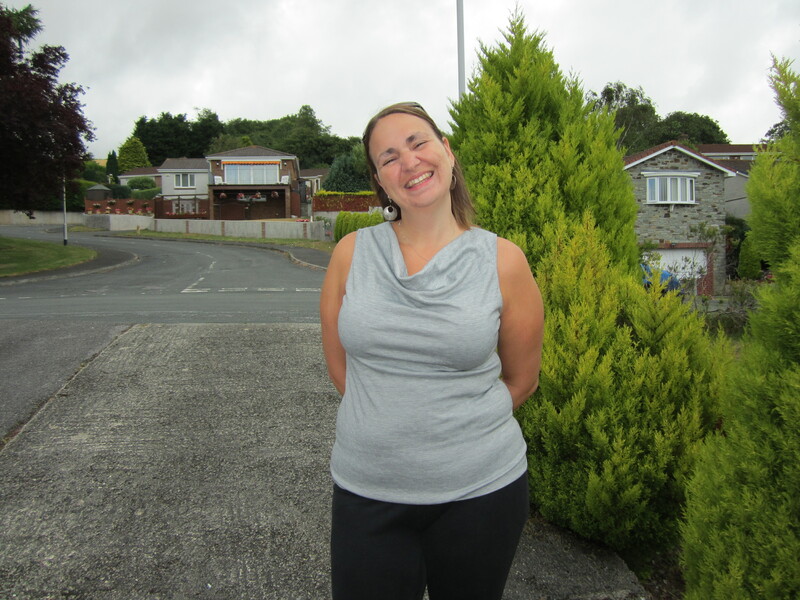 The family of one of Helen’s colleagues joined us too and would you believe it – she is a seamstress too! We spent all day riding around the streets of London only to find out in the last twenty minutes that we share the same hobby! To say it was exciting to have an in real life sewing conversation was an understatement! In addition to the cycling there was ample opportunity for sewing related stuff during my stay. 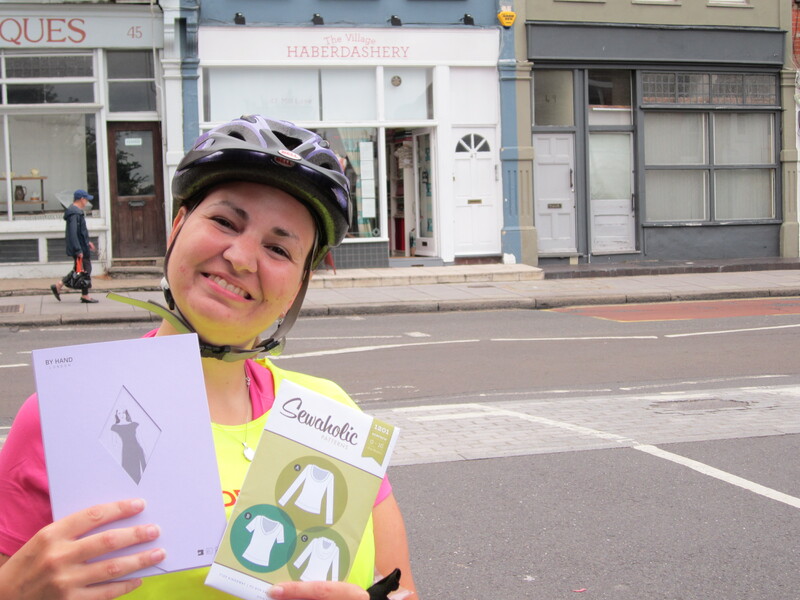 Before Ride Day we cycled to the Village Haberdashery shop – I’ve never visited before – and we had a great time. My husband bought me the Anna dress pattern from By Hand London and the ubiquitous Renfrew pattern from Sewaholic. I am so excited to sew these up! 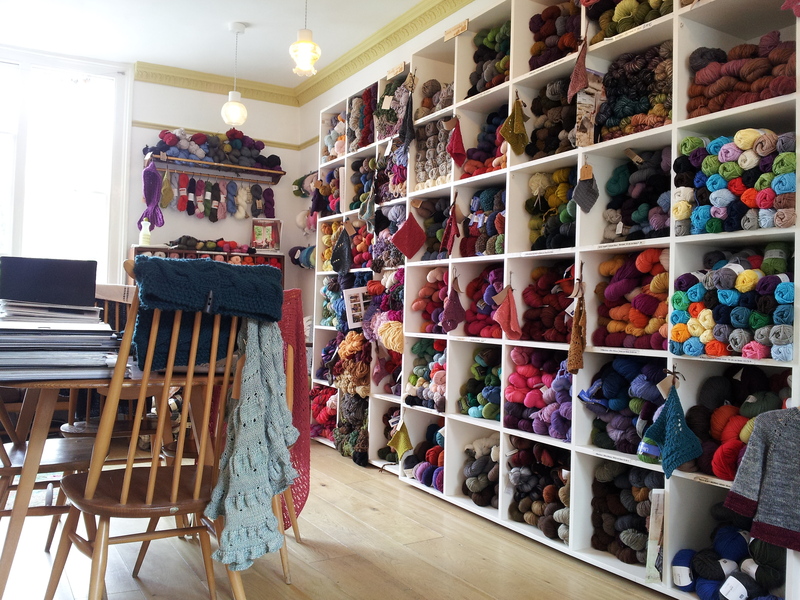 I also spent a serious amount of time curled up in Loop knitting shop. 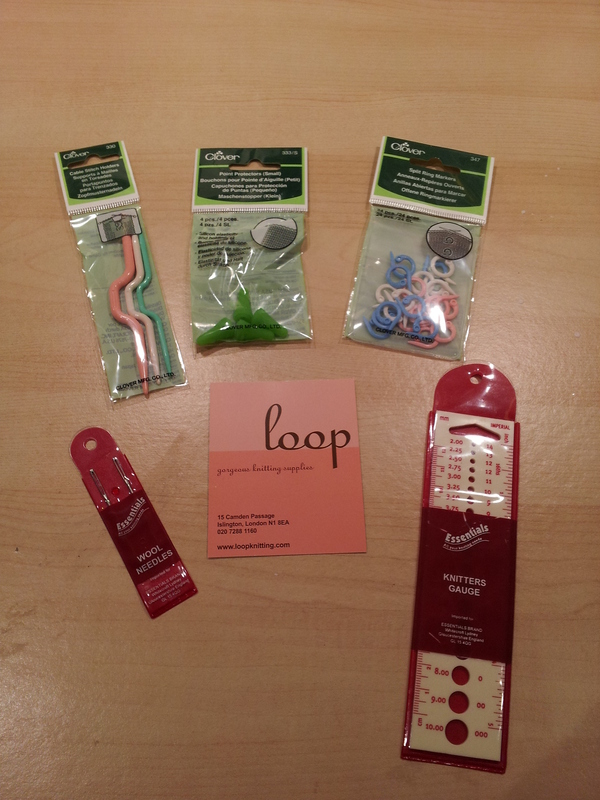 I got some wool sewing needles, a needle gauge, some cable needles, point protectors and removable stitch markers. I know, I know… I made my own stitch markers but having removable ones would be useful so I succumbed to these little dears. 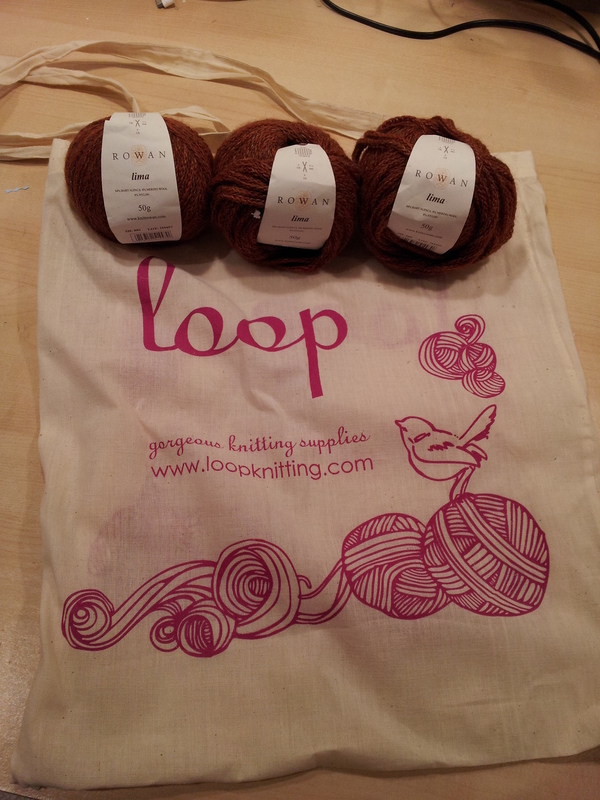 It is a aran/worsted weight and I am going to knit up this crofter’s cowl… at least that is the plan! Oh an by the way – that gorgeous tote bag? Totally FREE! I mean I just love that shop! 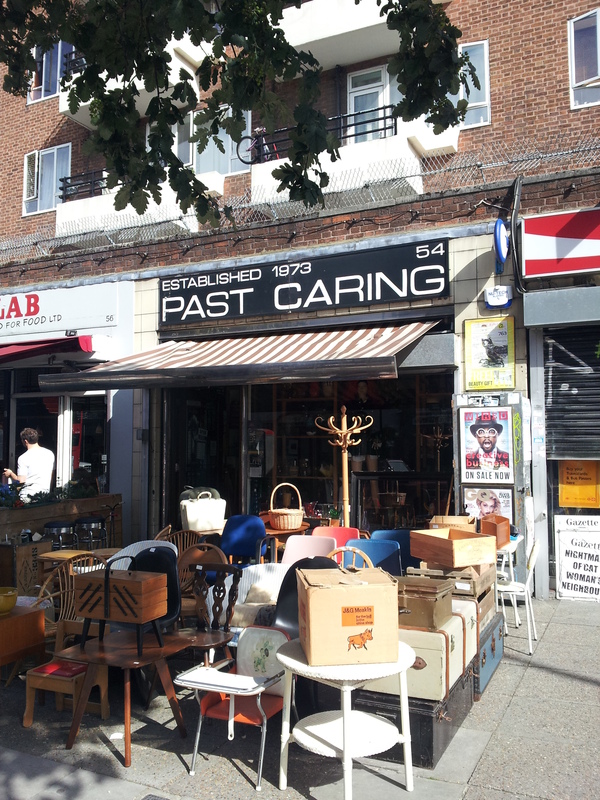 I thought I’d see if they had any old furniture or items to store sewing notions in. However I found a big stash of vintage sewing and knitting patterns also he has some lovely vintage buttons. As you can see, I’d already spent a LOT of money on my hobby this visit and couldn’t justify any more, but this place is going on my radar for next stay in London! So a fantastic long weekend in London! 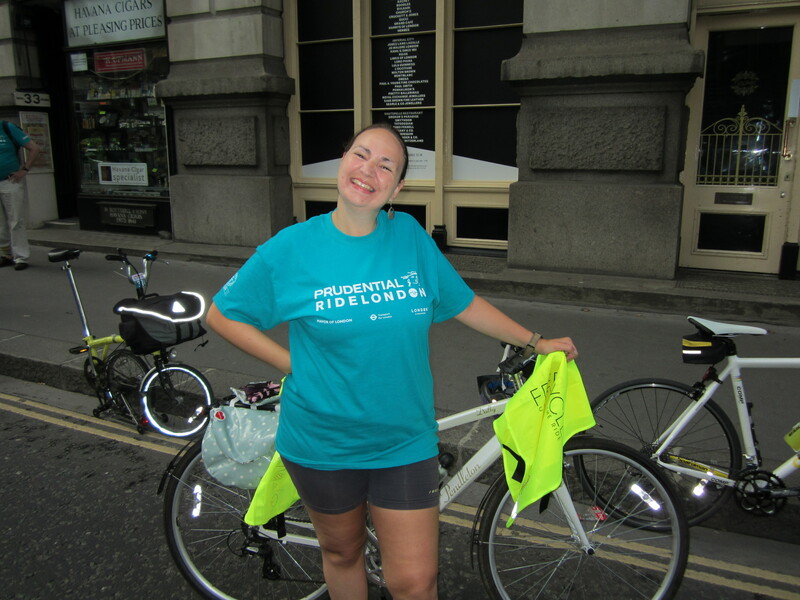 Did you participate in RideLondon? Have you sewed either the Renfrew or the Anna dress? Holy Crepe! The sewing machine broke! 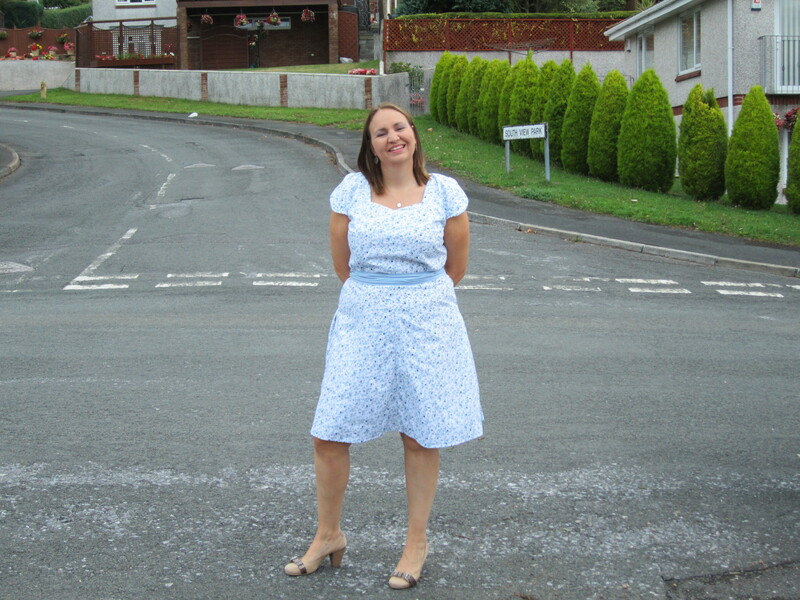 With the summer holidays in full flow I thought I would devote my time to making a dress. I have had the Collette Crepe dress pattern in my stash for a while (marked easy – we’ll see). I know this is going back a bit, but I am following Gertie’s sew-a-long from 2010. Hey – these things don’t date! This is my first attempt at a Collette pattern so I am excited to see how it goes. 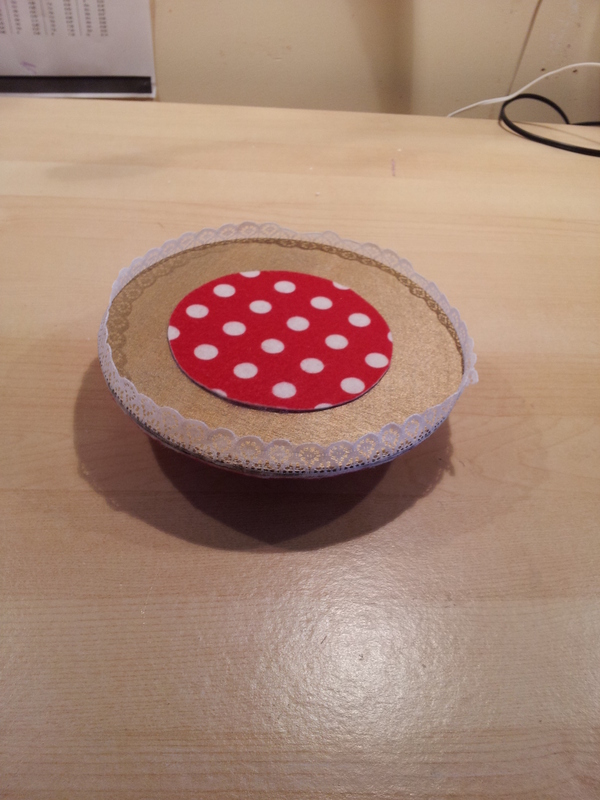 I have made a muslin and it fit straight out of the packet – hello, I could *really* like this company! 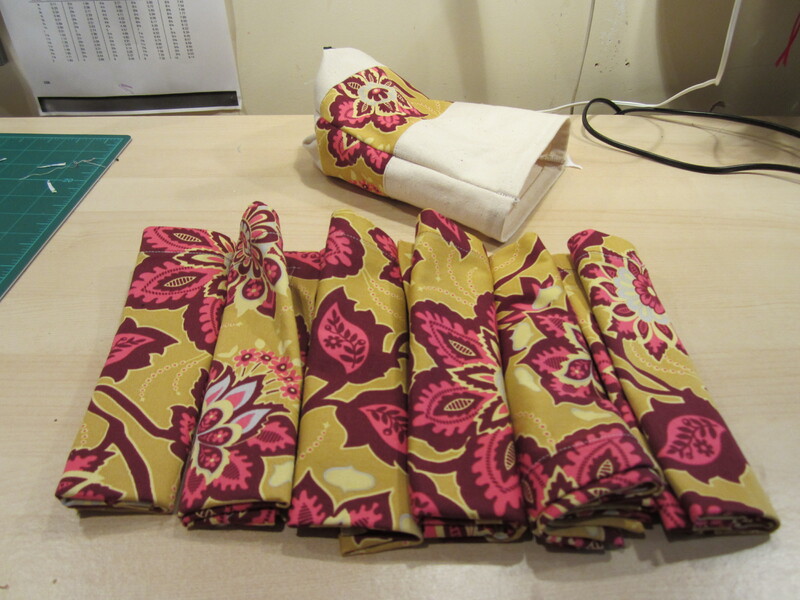 So I cut in to my fabric and even followed the underlining step – yes I hand sewed the main pattern pieces. This is by far the most proud I have ever been of a dress. I was just stitching on the ties when THIS happened!! The needle clamp in my machine broke! Apparently I’ve been “over-tightening [my] needle screw”. Sounds painful. So not only is my beautiful Stitchy ill but possibly the best thing I’ve ever made is sat unable to be finished AND it’s the summer holidays! Woe is me! 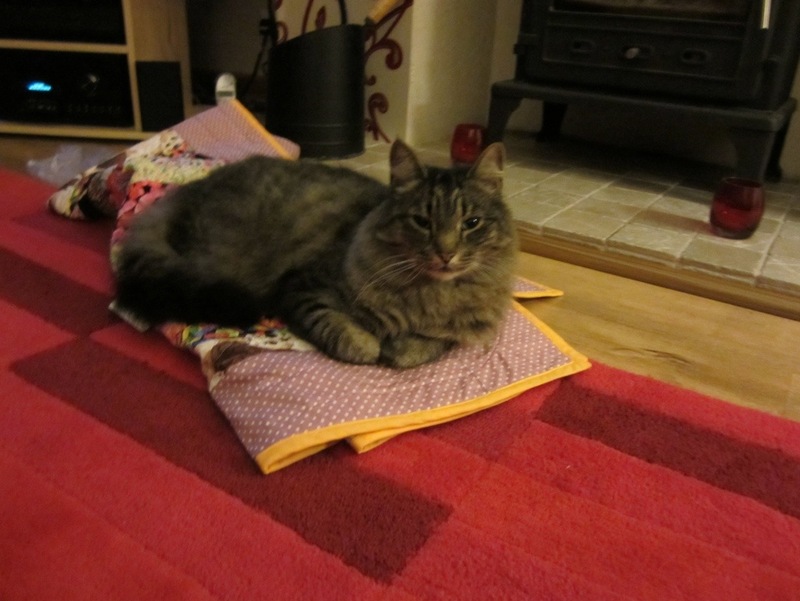 I am going to take him down to The Sewing Studio in Redruth to see Dr Darius. They were so good on the phone and are going to change it for me as soon as I can get down there, I feel so lucky to have access to such a wonderful shop but it isn’t half a pain to have to drive all that way. Oh well, there are much worse things in the world, but this is certainly frustrating! Have you ever been unable to finish a beloved project due to mechanical failure? Did you know you could over-tighten a needle screw!? 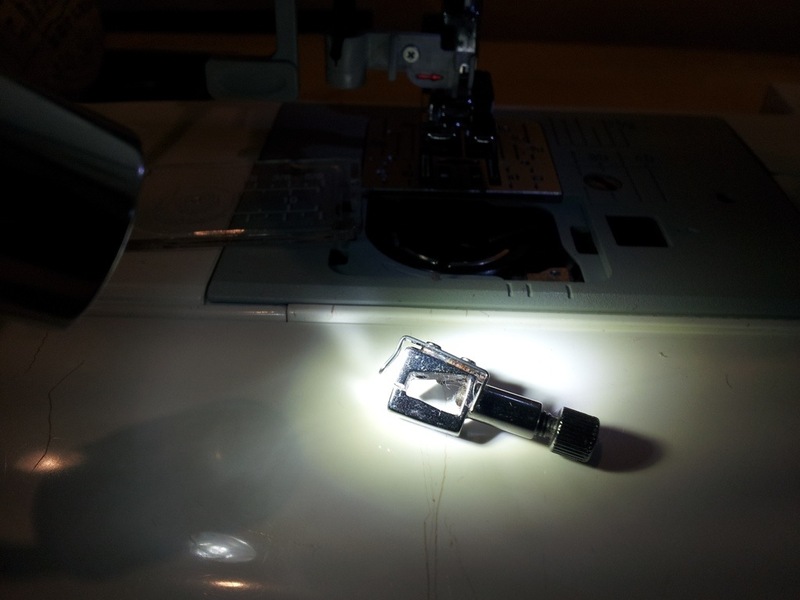 Does your sewing machine have their own Doctor!? When I finished my Craftsy Block of the Month quilt one of my commenters called V from sometimesshesews.blogspot.com introduced me to the notion of a jelly roll race and provided me with this link to youtube as I’d never heard of it before. So basically all the pieces sewn end to end in to one long strip then the long ends of the strips sewn together again, and and again and again until you have a quilt. Erm , hello, I LOVE that idea! Sadly I have nobody to race so I have called it a jelly roll frenzy. What brilliant fun! So quick! Sometimes it can feel like when you do anything labelled ‘sewing’ you actually spend a considerable amount of time doing other things like cutting, planning, pinning, ironing etc – this is just pure unadulterated SEWING! I simply loved making this quilt top! 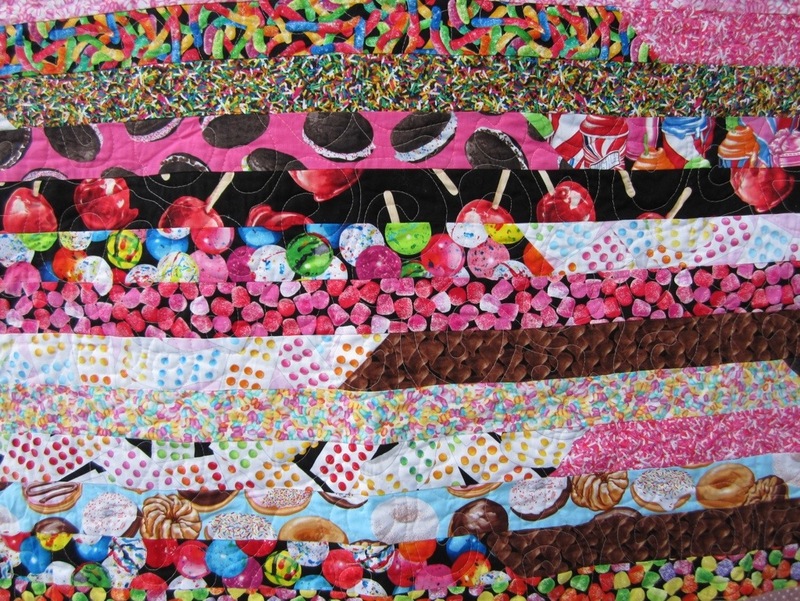 I think everyone should have a jelly roll in the cupboard so you can whip one of these babies up when you just need some mindless escapism at your sewing machine. I sashed with a pinky polka-dot and bound in a gorgeous sunshine orange. The backing was big fat magenta polka dots. I finally got round to watching the free craftsy course on creative quilt backs (need to review that) and used the technique to match large prints. 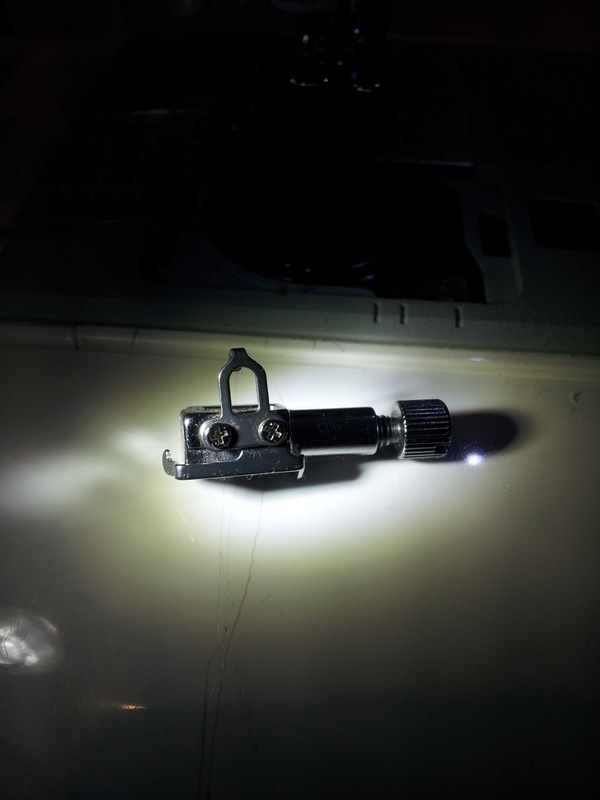 Worked really well – can you see the join? More Craftsy I’m afraid… I recently bought free-motion fillers by Leah Day as one of my Christmas presents from my Dad -he got me a gift voucher for three classes. Again, must review when I’ve finished it. I found a lovely pattern in lesson three “independent designs” named “basic spiral”. I thought it looked like swirly sweets so it fitted with the fabric perfectly. Frankly the quilting leaves something to be desired and is a bit clunky but from a distance it has the effect I wanted. I love the finished article and am really peased with the size, this is just perfect for snuggling on the sofa. Sadly, I think the overall effect is a bit too little girl with the sweets and the pink. 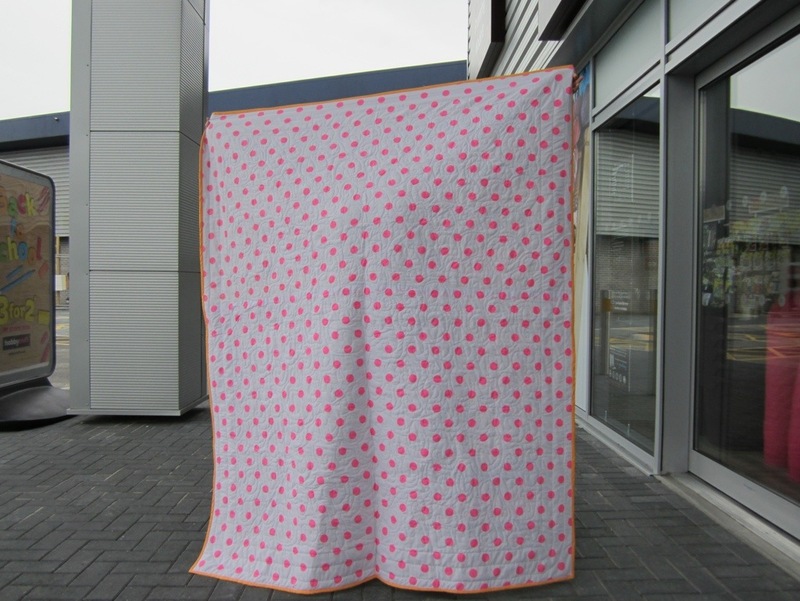 I am considering giving it away, but I really love it – clearly there is still a little girl very much inside and not even attempting to get out! Have you ever done a jelly roll race? Have you made something which hasn’t turned out how you thought, but you love it anyway? Any other little ideas like the jelly roll race I can try? !